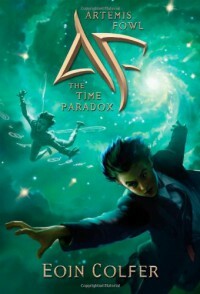 his is the sixth book in the Artemis Fowl series, and I'm sad to say I really didn't like it as much as the first four. The fifth book I gave up on halfway through, however, and I DID manage to finish this one, so that's a plus, I suppose? I just felt strongly that I had read this all before, which was because I had. Okay, Artemis' Mother falls ill, (which was happening in the first book?) and Atemis finds that the only possible cure is the brain fluid of a rare lemur, that he was instrumental in killing off when he was ten. The solution? Enlist the help of the demon N01, that we met in the last book (only I didn't cause I didn't read it, but he seems perky enough,) and go back in time to steal the lemur from himself! Given the enviromentalist/moralist tone of the book (Artemis is turning his genius to building carbon neutral planes! Mrs. Fowl is all about the green lifestyle! LYING IS BAD, and Artemis will demonstrate this!) I'm pretty sure that the reader is NOT supposed to come away with the impression that being moral makes one weak and/or stupid. But that's what happened, for me at least. I kept watching "older, Moral, smart, benefit of experience" Arty be bested by "young, immoral, smart, inexperienced" Arty. While Butler was reduced to one good scene! ONE, where he turned the plane around. GAHHHH????? ALSO WHAT IS WITH THE KISSING? WHO DECIDED WE HAVE INTER SPECIES ROMANCE? WHYYYYYYYY???????? Also: THE BRAIN FLUID OF A LEMUR? WHAT. THE. ROSS? Moreover: WHY MUST WE HAVE OPAL AGAIN? WHYYYYYYY. I WANT NEW BAD GUYS WHO ARE SMART. She was barely even smart, just insane! And I mean yes, she had some good lines, but seriously! SHE WAS HARVESTING THE BRAIN FLUID OF ENDANGERED ANIMALS WITH LEECHES IN CAVES IN MORROCO. LET HER DIE ALREADY. I gave it two stars out of five. I will only read the next book with EXTREME caution.